My husband has chronic shoulder pain related to a birth deformity known as shoulder dystocia. The joints have deteriorated so much that he will have to have a complete shoulder replacement in a few years. In the meantime, he has learned to live with the chronic pain because he refused to take pain medication as he is worried about side effects. 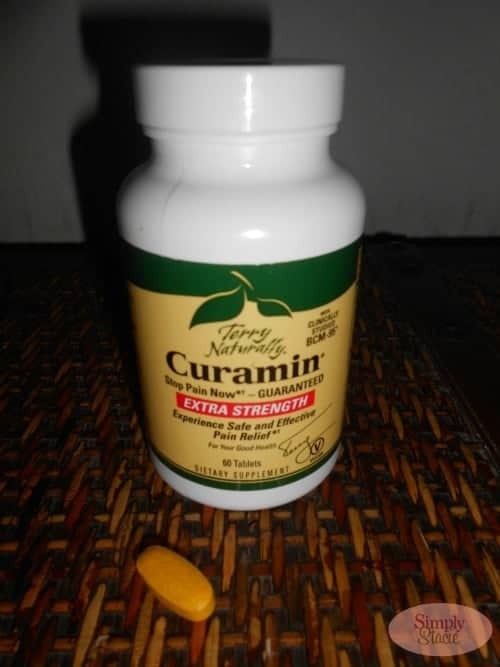 Curamin® is noted to be a blend of curcumin BCM-95®, boswellia for inflammation and DLPA, which is the amino acid phenylalanine and nattokinase which is an enzyme to help micro-circulation. My husband was excited to try a product that may be able to help with his pain level and since it was naturally derived he tried it. He took one pill three times a day for two weeks. While the company notes that some people may have pain relief within 20 to 45 minutes, it took him two days to feel noted relief (the helpful manual indicated this so it was expected it might take longer for each individual). In fact, he told me that for the first time he wasn’t concentrating on his shoulder pain while at work and realized that the only change was that he had been taking Curamin®. He did not experience any noticeable side effects and was so excited to have some pain management for his shoulder. I don’t normally get headaches but when I did, I decided to try Curamin® and I was pleased with the fact that my headache was gone within 75 minutes of taking one pill and I didn’t need any further tablets that day. A 60 count bottle of Curamin retails for $38.95 and is well worth the price to bring my husband some much needed pain relief. I highly recommend learning more about how Curcumin may be the “21st century cure” by reading the informative booklet by Jan McBarron, M.D., N.D. You are invited to visit Curamin to learn more about this product line and get find purchasing information at a natural retailer nearest you. I really like that it boosts healthy circulation, I have very bad circulation and would love to try it. Blending four powerful, effective and clinically proven ingredients into one award-winning product provides an unprecedented level of natural relief. sounds really good to me, i would love to try it! I would like my boyfriend to try this because he fell off a roof over 10 years ago. He broke both his legs and shattered his heel. He take Percocets every day because of the pain. I like that it fights pain naturally. I like that DLPA (DL-phenylalanine) has been shown to help maximize the effects of endorphins, the body’s own powerful pain relievers. I like that it maximizes anti-inflammatory properties. Since I have so much pain due to heritable collagen disorder, Ehlers-Danlos, and autoimmune collagen-vascular disease, lupus, I am interested in this product. I like that the chance of these healthy ingredients causing a risk of allergies is extremely low or non-existent. I would like to try it for my back and leg pain. I have a degenerative spine disorder that has caused multiple bulging disc to press on nerves in my leg and arm which causes constant pain. I like that Curamin provides consistent and long-lasting effects. I like that it is a natural pain reliever. Curamin contains a super-absorption curcumin called BCM-95 that can be up to 10 times stronger than plain curcumin products.